The last few days have been crazy busy, so thus the radio silence. It all started Monday with a job interview. The interview went well, and Tuesday night they offered me a teaching contract. They had a vacancy and I had to jump to get everything settled. I had already agreed to sub for Los Gatos for a few days, so I had to sub and then run around after a full day of school trying to get all the details worked out. I took a TB test, fingerprinted, printed and signed my contract (it was like 30 pages!) and scouted out things at the school. Last night the family, Roomie and I went over to Singlebarrell, this epic Prohibition era style bar in San Jose. We got there early and enjoyed a nice cocktail (or two!) before grabbing Thai food for dinner. We saw this yarnbombed tree, and it made me laugh. 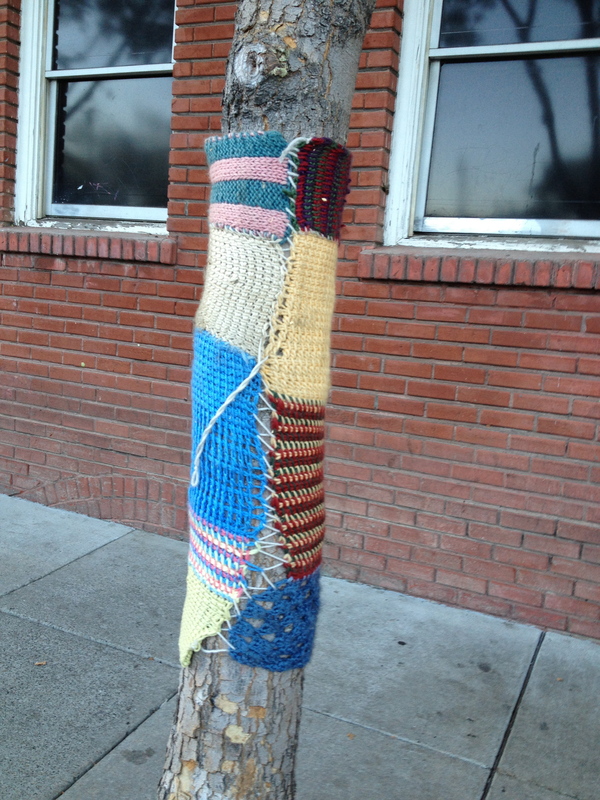 A yarnbombed tree in San Jose. I got my keys to my classroom today! I start Monday. I will teach intro to art for two periods and then I am the Site Testing Coordinator for the rest of the day. I will be giving tests like MAPS, CAHSEE and CELDT. Sounds like fun eh? But the best part is that it’s at Roomie’s school so we can hang out together at work, just like last year! Now I am off to my mother’s birthday dinner. Tomorrow, my best friend Robert will pick up his swanky new car. Do you have any weekend plans? Was your week exhausting like mine was?